If you are unaware about upholstery cleaning, let me tell you. Upholstery cleaning is one of the essential parts of cleaning in your house and also helps to keep the area germ free. Upholstery cleaning should never be ignored in-house nor in office. Cleaning of soft sofa and armchairs textiles is vital because this is the place where the majority of dust and viruses accumulates. It is essential to keep in mind that you never miss out on any corner of your upholstery while performing upholstery cleaning and vacuuming. To experience the best results, you must hire a professional upholstery cleaner. Hence, there are so many Benefits of Hiring a Professional Upholstery cleaning. Eco Friend Carpet Care upholstery cleaning services ensure great advantages for your health and keep your drapes and furniture looking brand new. We provide best upholstery cleaning in Las Vegas. Here we have shared three useful points that state the significance and benefits of hiring a professional upholstery cleaning service for your drapes and furniture looking in the top condition. The continuous buildup of pathogens and dirt inside your home or office can cause a health risk to you and your family. Without your knowledge, the fleas, dander, and dust can accumulate into your furniture making it unhealthy to use. In this case, it is very important to hire an upholstery cleaning services to ensure clean and germ-free furniture. Eco Friend Carpet Care professionals will efficiently eliminate the tiny dirt and dust particles without causing any kind of damage to your upholstery fabric. This helps in creating a healthy and dust free atmosphere in your office and home. To enhance the indoor air quality of your home or office, they need to have a professional upholstery cleaning in Las Vegas. Usually, the presence of dust, allergens, and mildew are trapped in the upholstery fabrics. Which is the major reason for the cause of bad indoor air quality in your office or home. And also triggers breathing problems. To get rid of a bad indoor air quality, you can rely on professional upholstery cleaners. The professionally trained and knowledgeable cleaners use the appropriate cleaning tools and equipment to properly clean the dirty upholstered furniture. Haring professionals to take care of your upholstery furniture is great because professionals take utmost care to clean the upholstery furniture in a safe way. Similarly, Eco Friend Carpet Care uses the correct methods and products, the professional cleaners will effectively clean up the furniture to keep them in pristine condition. Eco Friend Carpet Care upholstery cleaning puts a new life in your upholstered furniture and makes it look and feel new and fresh. There is no doubt, that our upholstery cleaning service will give an experience of safe cleaning and extending its life. If you are in search of expert upholstery cleaning in Las Vegas? Then you can totally rely on Eco Friend Carpet Care! We specialize in delivering the best upholstery cleaning service to ensure clean and stain-free furniture with an enhanced look and appearance. Our highly trained upholstery cleaners in Las Vegas use industry-standard cleaning equipment and products to deliver the best upholstery cleaning service in Las Vegas. For booking a professional for upholstery cleaning service, please feel free to contact us today at (702) 768 4900 or fill up our Free Online Estimate. 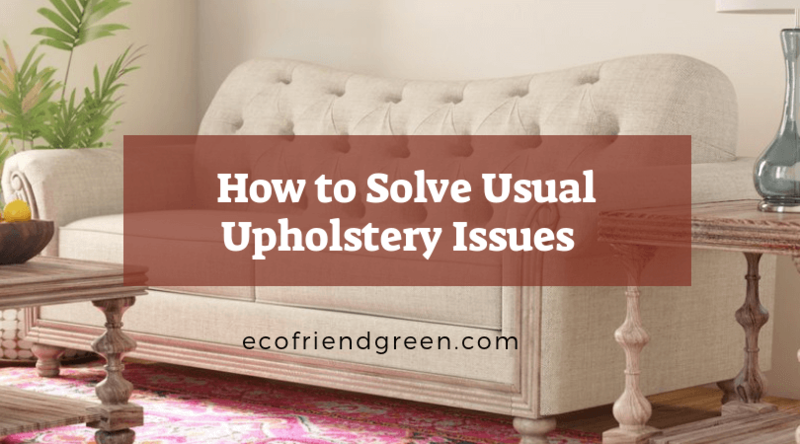 This Upholstery Issues usually happens when the upholstery dye bleeds onto the area around it. Correcting bleeding can be difficult, but modern dye stabilizer and low moisture system make bleeding occur less. What should you do: use a cotton bud to apply a tiny amount of hydrogen peroxide onto the area. Rinse with a neutralizing solution to avoid other untoward effects. Watermark looks like a ring and they are the residues of soiling that dissolved. Sizing makes the fabric taut and prevents it from wrinkles. Watermarks are clear most of the time but are brown if the upholstery was not dried properly. What should you do: in most cases, the best and simple way to remove watermarks. Just moisten the area slightly using the distilled water. This usually happens when the fabric of the upholstery becomes excessively wet and takes too long to dry. This is usually the case when the upholstery is too dirty and requires several rounds of cleaning. To avoid this issue, make sure that the water is extracted thoroughly and the upholstery is dried right way. What should you do: it’s vital to rinse detergent completely from the upholstery because it holds a high level of pH that will cause the fabric to become yellow if not rinsed properly. You need to use neutralizing agent specifically for upholstery to get rid of the browning. If your upholstery has excessive browning, the better option is to approach professionals to handle it. They can deal with it in a better way that to in a safe way. Shrinkage sometimes can be unavoidable for certain fabrics such as cotton. Luckily, this kind of issues can still be fixed. What you should you do: you can use a hand steamer to take care of such conditions. All you need to do is steam the fabric and pull it back or stretch it carefully to restore its shape. These are tips you can follow to avoid ruining your couch, sofa and other types of upholstered furniture. To avert issues caused by upholstery cleaning, be sure you get qualified professionals like Eco Friend Carpet Care to deal with upholstery problems. Call us at (702) 768 4900, today. We provide upholstery cleaning services in Las Vegas and nearby areas. You can follow Eco Friend Carpet Care on Facebook, Instagram, Youtube, and Twitter to get some more information about our services. Upholstery cleaning right after the party is vital because of the wear and tear it goes through are one of those very few particles present in our house which deserves proper care. The appearance and style of the interior improve significantly by adding stylish upholstery. It not only makes your house look great but also showcases your choice. It is a reflection of the level of sophistication in our living thoughts. Even though our busy schedule or immense work pressure, we need to take some time to clean our home. We usually take diverse measures to prevent or restrict activities of our kids or family members to ensure safety. We usually make sure that our upholstery stays in best condition. Alongside being costly, these particles are very much exquisite on the surface. They can easily get scratches, buries, spots, and stains which can simply damage the overall appearance of the thing. It can create a dull aura and also make you mood low. Usually, we go out of our way to be careful regarding the safety of our upholsteries from any sort of threats which can affect their hygiene and look. Parallelly, we should also take some actions immediately after an event or party at our house. Get together of guests, relatives, friends especially in some formal occasion or party can surely cause damage to upholstery. So, once you are done with your function, gathering or whatever, you should follow the following steps to keep your upholstery intact from the wine spills and gravy stains. 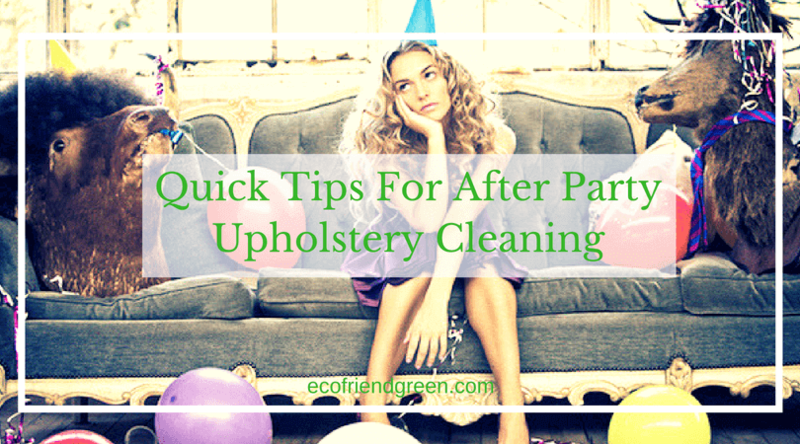 Here are the quick tips for after party upholstery cleaning! Move your palm into the niches of your furniture for loose food crumbs, dirt, spills, dust, and dropping. You can use a glove to frisk. Use your vacuum cleaner to remove all loose dust, dirt, food pieces etc. After locating the position and amount of dirt, remove the marks and stains first by using your upholstery cleaner or any home-made cleaner. The marks and stains could be of alcoholic or non-alcoholic nature, they could also be creamy or semi-solid food items, sauces etc. Once you are done with the cleaning task, ensure that there is no excessive moisture on the surface of the sofa, couch upholstery. Because wetness can directly result in erosion on the surface of your belongings. Utilize upholstery and crevice extension along with your vacuum cleaner. Give a thorough clean-up to all nooks and corners. Give special attention to all grooves, curves and hidden portions of the upholstery. Hidden particles can directly result in corrosion of surface inside the upholsteries resulting in wear and tear. Finally, gently spray room freshener to all over the party spaces. This will make the interiors of your house look and smell as good as pre-party. Had a party? Require Professional Upholstery Cleaning? Call Eco Friend Carpet Care today at (702) 768-4900. We provide upholstery cleaning service in Las Vegas and nearby areas. Visit our website to know more about our services.